If you are experiencing inconsistency with your standard putter, then a belly putter might be just what your game needs. If you've been struggling on the greens lately with your traditional putter, it might be time to give the belly putter a try. Belly putters take some getting used to, but the advantage is that they restrict your hands from twisting open or closed as you make your stroke, theoretically ensuring a straighter, more under control putt. 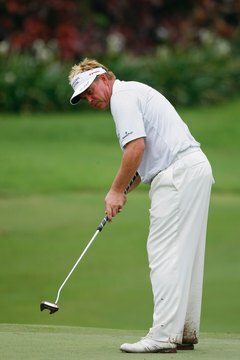 Place the belly putter in the middle of your stance, with your feet about 18 inches apart. Make sure the top of the putter's shaft is resting on your abdomen, about 2 or 3 inches above your belly button. The club should never rest on your belly button while making a putt. Bend over the putter at a 45-degree angle. Keep your feet far enough apart to be completely balanced. If your putter is too long or not long enough, it will affect your putts. When buying a belly putter, have a golf professional or a knowledgeable employee make sure it is the correct size. Grip the belly putter as you would a traditional putter. Before you hit the ball, make sure it is in the middle of your stance. If the ball is too far forward or too far back, you'll likely mishit putts. Practice. Get comfortable with your new putter. If you tend to hit the ball to the left of the target, chances are the face was closed. If you tend to hit putts to the right, chances are your club face was open. Make the necessary adjustments and keep practicing until you feel comfortable.